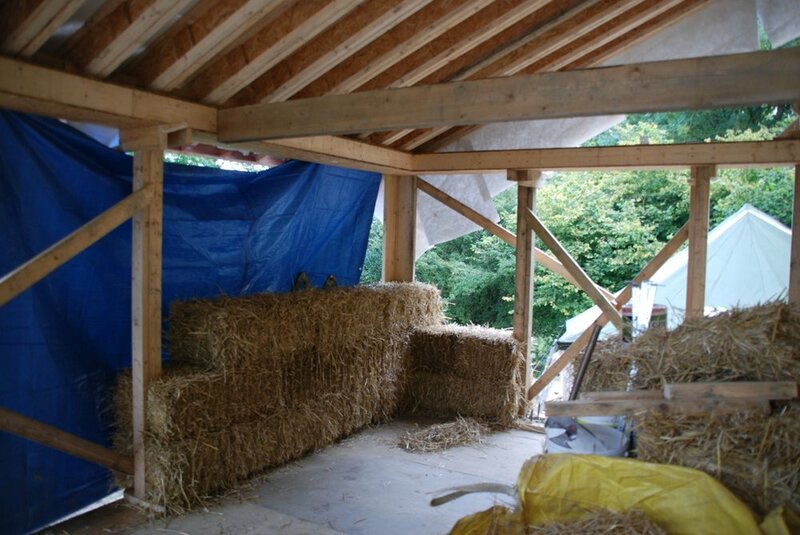 Half bales, notching, stakes and fiddly bits! To get a good brick style course of bales your going to have to have make ‘half’ bales. This means splitting a bale into two parts. Not necessary equal, but to fit the space you need it to. Splitting is done with a giant needle and thread. It’s hard to describe, and to be honest the best way of explaining it would be in the diagram in the ‘Building with bales’ by Barbara Jones book. I will give a brief explanation for the purpose of this blog. Measure the space that you want your bale to fit. Thread your baling needle (this is essentially a metal rod with two eyes at the point end, and a handle at the other) with two pieces of baling twine. If you do one going left to right, and the other right to left, it helps to distinguish the twine in a second. Measure your bale to the size of your gap using a tape measure. Insert your baling needle at the desired length, and at the same height as the existing string. If your happy that the needle has come out at the right height (i.e the same as the existing twine) and has gone straight through and not at an angle. Then you can remove the twine from the eyes and withdraw the needle. Make sure needle points are stuck into bales when not in use, to help prevent accidents! With your two pieces of twine, do two truckers hitches, one on each half. Repeat process for the lower twine. Once your happy you should be able to cut the existing twine and split the bale into two…… Hopefully your twine hasn’t become tangled during the process! A little tip is to cut the existing twine at the knots, this way you can re-use the twine for more half bales. 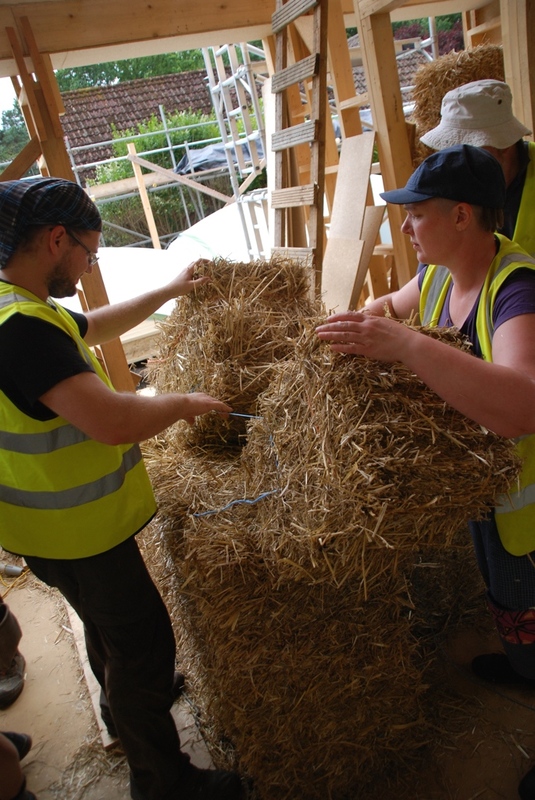 Pictures from earlier straw works course, it seems I got so excited with the walls going up I forgot to take many photos! At your window / door frames your going need to notch the bales around the posts. At doorframes or where there aren’t bales the other side this will me a full notch. Where you have a bale either side of the post do two half notches. Two half notches is better than one full notch and a square bale. As the corners slow down air movement by creating vortices, meaning a better air tightness and therefore fewer drafts. Use a template (bit of wood same size as your post) to help you notch to the right size. Measure to make sure your template in central to the bale. Using the Alligator saw (Ours was nicknamed Ali), or you can use a hand-saw (though slower, and in my opinion not as cleaner cut). Cut either side of the template to the required depth. Being carful not to cut the twine. Clean out notch and check depth of your notch. A terrible explanation I know, however fortunately Jeffery made a handy video! From the third course onwards we staked through our bales. Two stakes per bale, to pin the whole wall together. On the third course ash stakes where 90cm long (penetrating three courses of bales), thereafter stakes where 70cm long (penetrating two courses). As I have said before hazel is the preferred choice for stakes, however we could coppice the ash from next to the site. If you have some bales that are tough to get into place. A little tip is to use a plastic sheet that you can slip in between the bales to reduce the friction. Once the bale is in place you can whip the sheet out….. Kinda like the old whipping the table cloth out from under the plate trick….. Remember though, SNUG NOT TIGHT!